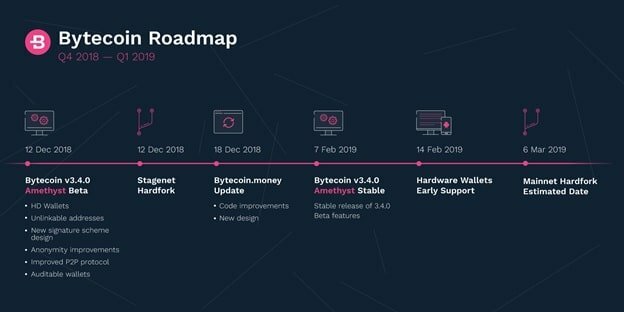 For the roadmap, The Bytecoin team has set six milestones including a hardfork, a web wallet update, early support of hardware wallets, and two essential releases. The team is planning to implement a HD wallet, unlinkable addresses, and improve P2P protocol and signature scheme. The new Beta builds (v.3.4.0 Amethyst) are scheduled for release on December 12th, and the stable Amethyst version is going live on February 7th, 2019. The mainnet hardfork is scheduled for March 6th, 2019. The alterations planned for Bytecoin’s codebase are poised to change the point of view on the CryptoNote technology completely, as the most provocative update is the introduction of auditable wallets, a feature that doesn’t coincide with the traditional logic of any CryptoNote-based coins. While the development team anticipates a lot of uses for this feature, they haven’t mentioned the utility of this feature. Another innovation that should be interesting for project followers is early support of hardware wallets. The planned software improvements, as mentioned in Bytecoin’s blog, display the logical progression of work the team has shown in the past months, and these improvements probably represent the most diverse and innovation-rich roadmap so far.